If you have struggled with the so-called miracle reducing diets, you may find it difficult to believe that the tested, proven method of weight control outlined in STOP DIETING, START LOSING can allow you to eat so many good things. Excess protein not only gives you energy, helps keep complexions clear, hair sparkling, health at top form, but also speeds slimming. It is a most important factor in weight reduction; the presence of excess protein makes it possible for your bodys metabolism to burn up unwanted fat. Obesity is one of the most pressing of todays problems. 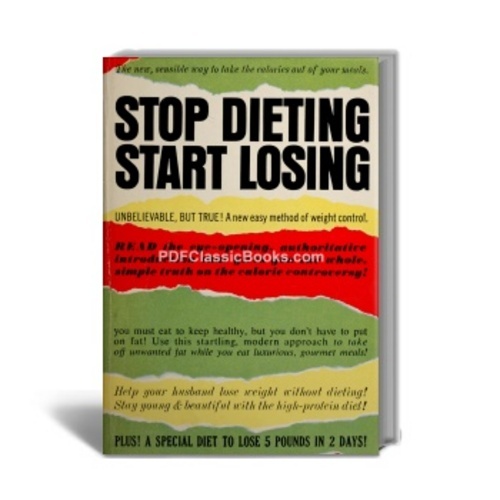 Originally published in 1957, STOP DIETING, START LOSING gives you a positive, dynamic way of controlling your weight. You must eat to keep healthy, but you dont have to put on fat! Use this startling, modern approach to take off unwanted fat while you eat luxurious, gourmet meals!